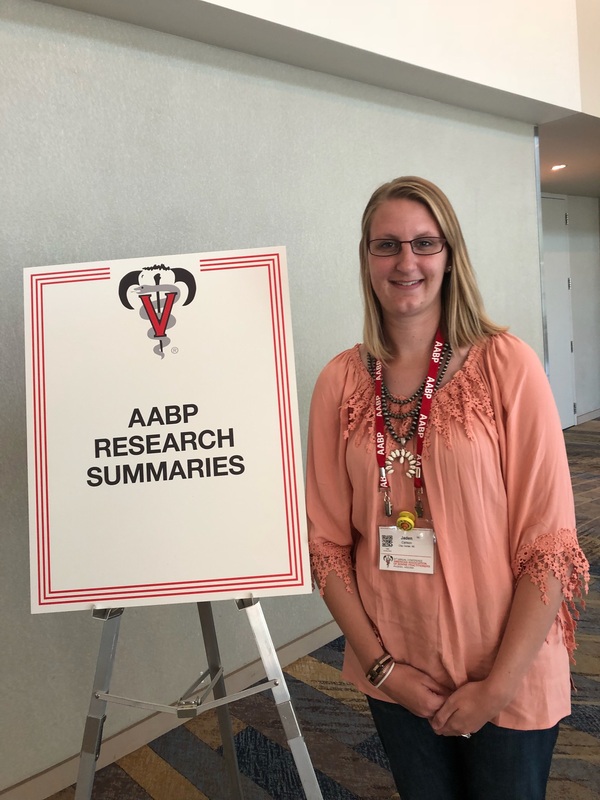 Jaden Carlson, a UNL graduate student in veterinary science, presented a Research Summary titled "Detection of Bovine Viral Diarrhea Virus in Stable Flies (Stomoxys calcitrans) following consumption of blood from persistently infected cattle" at this years 51st annual American Association of Bovine Practitioners (AABP) meeting in Phoenix Arizona. Bovine viral diarrhea virus (BVDV) is an important pathogen of cattle around the world. Effective control relies on detecting cattle persistently infected (PI) with BVDV and removing them from herds. Currently, detecting PI cattle requires resource intensive individual animal sampling. Consequently, routine surveillance for BVDV is not commonly conducted. Developing methods to classify the BVDV status at a herd level without the need to handle the cattle would remove many obstacles to controlling BVDV. The objective of our research was to determine the feasibility of using blood feeding insects, in this case stable flies, as a sampling tool to detect BVDV in a herd. We hypothesized that BVDV would be detectable in stable flies that had fed on blood from PI calves. To test the hypothesis, blood from PI calves was fed to stable flies obtained from a research breeding colony. Blood free of BVDV was fed concurrently to a group of stable flies that served as negative controls. Limits of detection were tested by diluting BVDV-fed flies with BVDV-free flies at the following ratios (BVDV-fed:total number of flies): 100:100, 40:100, 20:100, 10:100, 1:100. Each of these ratios was constructed from stable flies that had been fed 1, 2, or 3 days prior with blood from PI calves. Replicated groups of stable flies were homogenized and RNA was extracted for reverse transcriptase polymerase chain reaction (rtPCR) analysis. In total, 3 replicates of a 3 day by 5 dilution level matrix of samples were produced. All replicated samples were consistently positive on each day at the 100:100 dilutions and 40:100 dilutions, day 1 and 2 of the 20:100 dilutions, and day 1 of the 10:100 dilution. Samples from replicates were inconsistent on day 1 of the 1:100 dilution, day 2 of the 10:100 dilution, and day 3 of the 20:100 dilution. All replicated samples were consistently negative at day 2 and 3 of the 1:100 dilutions and day 3 of the 10:100 dilution. While significant research is still required to refine and validate the use of stable flies as a sampling tool for BVDV detection at a herd level, our results demonstrate that BVDV can be detected in stable flies a number of days following ingestion of BVDV and even when only a few of the flies present have fed on BVDV infected blood.